When I first read the book “The Fire and Light of Theosophical Literature”, I knew little of the Theosophical Movement, apart from vague references to the Theosophical Society and Helena Blavatsky in articles and publications within New Age circles. My aim with this piece is to illustrate the role of this book within the wider Theosophical Movement, explaining my own process of understanding, which led me from being a mere dilettante, someone curious about the Occult, to commit myself to contribute to the Movement. The first part of the book examines the premises and general context of the active, current conflict between wisdom and dead letter in the human mind and the esoteric movement. It is by understanding this context that we can grasp the level of collective deceit that Mankind has been and is being subject to, and set the bases, in the present moment, to an ethical future. The second part analyses how mistakes and fraud were actively articulated, and how the movement has been getting rid of these illusions. The third part looks ahead at the future, showing the duty of the movement to help humanity take steps to a new civilization based upon Ethics. As a newcomer to the Theosophical Movement I had to come to terms with the purpose that the Theosophical Society was set to achieve and how the initial plan as outlined by the founders of the Movement was gradually deviated from its course. Perhaps the above paragraph sums up well the clear intention of “The Fire and Light”, which is not about “pointing fingers” and discriminating between “good and bad theosophists”, but rather - by analysing mistakes done in the past - about building better foundations for the future of the Movement. The Movement needs renewal, and little by little the Vatican-like structures and ritualistic approaches are disappearing. It seems clear from “The Fire” that it was statements as the above from HPB that paved the way to the future of the Theosophical Movement, rather than the developments in the Adyar Society; and that any effort in revitalising the Movement must come from within each of its members, following the clear and original teachings of HPB, without any attachments to bureaucratic institutions. 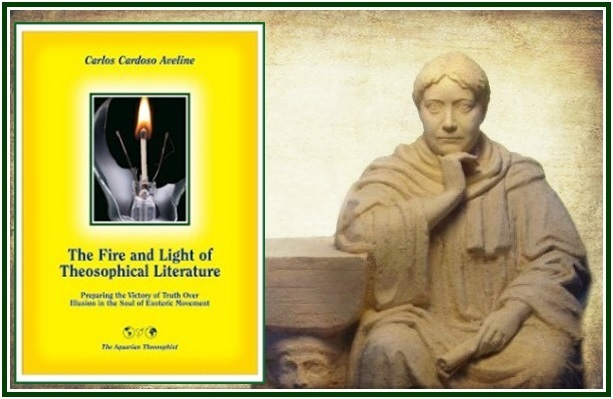 All pages indicated in this article refer to the book “The Fire and Light of Theosophical Literature”, Carlos Cardoso Aveline, The Aquarian Theosophist, Aveiro, Portugal, 2013, 255 pp. Born in Spain, Juan Pedro Bercial is an associate of the Independent Lodge of Theosophists. MSc in Pure Mathematics (Geometry), PhD (Materials Science), he has researched and published in the fields of Singularity Theory and Fracture Mechanics at the University of Liverpool (UK). He currently teaches Mathematics at a College in the North West of England. See in our websites the articles “The Making of ‘The Fire and Light’”, “The HPB Defense Project - 2016”, “A Timely Book for the New Age” (by Robert Kitto), “How to Obtain The Fire and Light” and “Buy ‘The Fire and Light’ Now”.